With Care by Design CBD Honey Straws, consuming medical cannabis becomes easy, discreet, and a lot tastier. This line of products from Care by Design are a sweet, medicated treat that helps with deep relaxation and pain management. The world is going cannabis-green and no company pivots the evolution better than Care by Design. Honey Straw is sourced from 100% organically grown California cannabis and organic local honey. It also contains cannabis oil extract, processed in a PFC-certified lab using a supercritical CO2 method. This CBD-rich honey straw has a dominant weed flavor and delicious honey impressions and are available in varying ratios of CBD to THC for each user’s personal preferences. To enjoy the medicinal elements of CBD and avoid psychoactive effects, choose the honey straw with an 18:1 CBD:THC ratio. To feel some high sensation, opt for the 4:1 CBD:THC ratio. 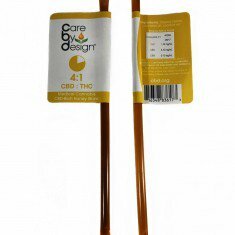 Care by Design CBD Honey Straws are perfectly safe for consumption as the cannabis used is laboratory tested to verify the cannabinoid and terpene profiles, bacteria, mold, and pesticide and fertilizer residues. They are available in Sativa and Indica Varieties. Add to your favorite beverage or enjoy directly from the straw.